Our first full week of no resources to stimulate fully engaged creative nature play started this week and it was beautiful. The children showed a real interest in wildlife and spent a lot of time watching birds fly, hop along the ground and listened to them sing. They danced to the bird song and one of our children picked up a stick and twirled it in the air to be the conductor of the bird chorus. Due to the rains we have worms everywhere on site so we've been delighting in turning over logs and collecting lots and lots of worms. We've found mummy worms, daddy worms, baby worms, big sister worms and have been talking about habitats and making our own little worm homes complete with beds made from twigs and leaf blankets. Lucky worms. We've seen birds of prey, we've spied bunnies hopping in the grass, we've seen countless bees landing on flowers collecting pollen, we've spied caterpillars, have talked about butterflies and have collected rainwater and used water and fallen petals to create bird baths. We've spotted bat boxes on our adventures which inspired lots of talk about nocturnal animals and birds. 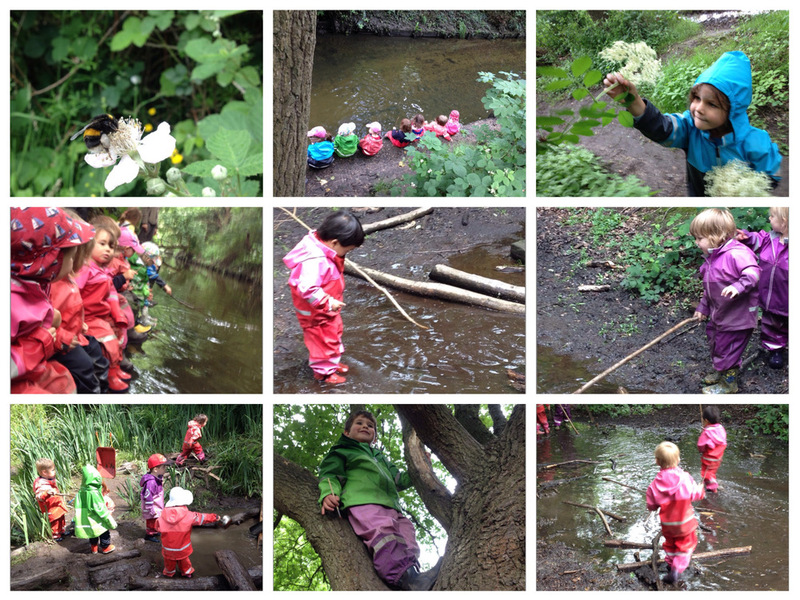 The rain has inspired lots of water play. We've put various containers out into the meadow to see which collects the rain the best and particularly enjoyed collecting rain in wheelbarrows. Then pouring and transporting the water all around the forest. We've picked wild mint and have collected elderflower and plan to follow through on our children's request to make wild elderflower cordial. We've fished, we've balanced, we've jumped. We've splashed, we've paddled in puddles, we've skimmed stones in ponds, we've experimented with running up and down hills and have laughed and laughed. It's been an especially heart warming week with lots of beautiful interactions amongst the children and between the children and their practitioners. Its weeks like this that we are so grateful to spend the time we do with such special children. Today we bid a sad farewell to Beatriz. It's been an absolute pleasure having her here in the forest during her time in the UK and we wish her all the happiness in the world for her future travels. This week we welcomed Alex and Antonio to the forest. Alex comes to us from New Zealand, where the educational approach to early years is fascinating so we welcome her expertise. Antonio is a primary school teacher from Spain usually focused on Physical Education. Any friend of Jose's is a friend of ours. It's been lovely to see how welcoming the children are. At one stage on his first day we couldn't find Antonio as he was buried underneath the children. Always a good sign! Here are some pics to put faces to the names. For those children leaving us for big boy and big girl school, we would love the opportunity to show your new teachers what your learning journey has been like so far in the world. If you let us know once you've heard from school who your teachers will be, we will get in touch with them to invite them to come and spend a morning with us in the forest. Next week is forecast to be beginning wet and warm and ending up hot and sunny! Now that the sun is here to stay, we would ask that on sunny days you apply a layer of sunblock to the children before you drop them off. We will then top up their sunblock regularly throughout the day. Also, please ensure the children have sun hats on sunny days.